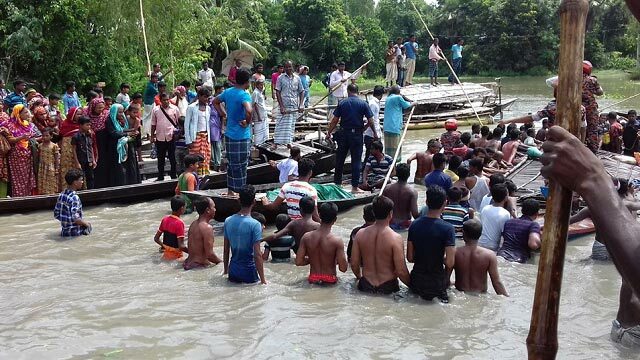 Panna, Sep 2 (Just News): The bodies of two people, who went missing as a boat sank in the Chalan Beel in Chatmohar upazilaon Fridayevening, were recovered on Sunday morning. The deceased were identified as Billal Hossain Goni, scientific officer of Ishwardi Regional Agricultural Research Station, and Rafiqul Islam Swapan. A team of divers recovered their bodies in the morning, said Chatmohar Upazila Nirbahi Officer Oshim Kumar. Earlier, the bodies of Momtaz Pervin Sheuli, 45, wife of Billal Hossain,ShahanzPervin Parul, wife of Mosharraf Hossain Musa, and Sadia Khatun, 12, daughter of Rafiqul Islam were recovered on Saturday. Five people went missing as a boat sank in thebeelaround7:30 pmon Friday when a crackdeveloped at its bottom.